This plant caught my eye; it sprung up in the lawn of my old home where I lived for 22 years, I’ve never seen it before so I can only assume this is the first year it’s grown there. When I first saw it, the easiest description was ‘furry red asparagus’, but since then it has opened up. At first I thought it was an orchid of some sort, but now I’m fairly sure it’s a member of the broomrape family (Orabanchaceae); interesting plants that grow as parasites on specific hosts. Because most of their energy comes from the host plant they have no chlorophyll (the stuff that makes plants green, or red, and converts sun into energy) – some are yellow, red or even whitish! 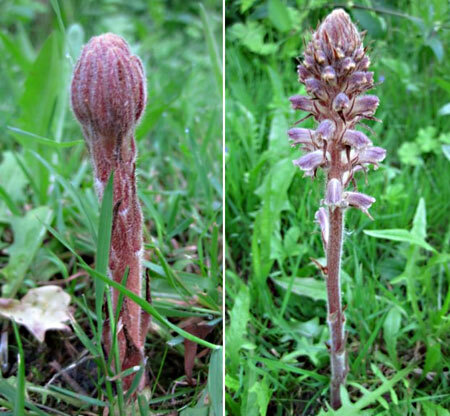 Because of where this one was growing, and the lawn weeds that were growing near it, it is probably Common Broomrape, which lives on ‘peaflowers’ like clover, and ‘composites’ like daisies. Has anyone else spotted any orchids or broomrapes near them? This entry was posted in The Woodlore Team on June 30, 2010 by Woodlore Team.